michelle obama: too comfortable as a “mum-in-chief” to be a feminist icon? On 21 November, Michelle Cottle of Politico magazine wrote a story titled ‘Leaning Out – How Michelle Obama became a feminist nightmare,’ which has sparked some pertinent questions: Is the American first lady a feminist, or not? Is she a feminist icon? Well, according to Cottle, her very recent move to become an ambassador for a new program called North Star, which has been set in place to help young people in the US to make it to college, with special initiatives to reach lower socioeconomic communities, is a move that will only further project her “Supermum” status and not see her become an “activist first lady”. Cottle believes that Michelle has never been, nor will she ever be, a feminist or political icon because she copped out of taking charge in The White House and left her husband to dabble in politics while she took on the role of “Supermum”. Cottle states that the first lady is just ‘who she is’ and so will not surprise any of us in her last few years in her post. Cottle is not alone in this thinking. Leslie Morgan Steiner, the author of Mommy Wars, wrote: ‘Are fashion and body-toning tips all we can expect from one of the most highly educated First Ladies in history?’ Keli Goff, a writer for African-American online magazine Root, told Cottle that she considers it ‘a national shame that she’s not putting the weight of her office behind some of these issues.’ Furthermore, Mrs. Obama is not helping us to think differently – she told us outright in her speech to the Democratic National convention last year that her most important role is ‘still mom-in-chief’, and she has appeared on multiple TV programs and news shows dancing, talking about children and giving us gardening tips. So, there is a backlog of evidence for anger against her. But defenders of the first lady still believe in her subtle yet inspiring feminism. They say that she is an exemplar of a movement of feminism that is ‘all about personal fulfillment and choices,’ both of which she has gained and worked hard for. She is also in a delicate position – as first lady she has to watch what she does in order to not overstep or disrupt her husband’s important position, as well as making sure she doesn’t tread the line of becoming an “angry woman” stereotype. There is a lot for the first lady to watch out for, and so of course she will have her critics. Cottle’s article puts the foot down on Mrs. Obama and labels her as someone who won’t ‘shatter the conventional First Lady mold,’ but her position as the first African-American first lady is a tricky one. Do you think Michelle Obama’s activism is ‘girly’ and not ‘gritty’ enough? Or do you think she has a good handle on her role as first lady to the first black president in American history? 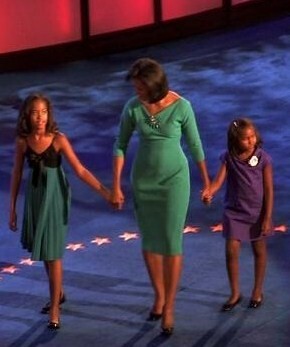 This entry was posted in News, Politics, World and tagged feminism, Michelle Obama, News, politics. Bookmark the permalink.